It's a new year for an all-natural you! One of my favorite ways of moisturizing (especially in this harsh winter right now) is to use body oils. I recently discovered and tried the Tammy Fender Bulgarian Lavender Body Oil- and this product not only moisturizes but also awakens your spirit, as well! What do I mean? Lavender oil is an essential oil that is commonly used in perfumes and aromatherapy. It contains many benefits that are therapeutic to calm and ease your mind. It truly has a scent that makes you feel calm and peaceful, which is great after a long day of work! Tammy Fender's formulation in this body oil is meant to nourish and protect your skin. I use this after every shower to keep my skin moisturized; and this absorbs quickly so it doesn't feel oily and leave an icky residue. 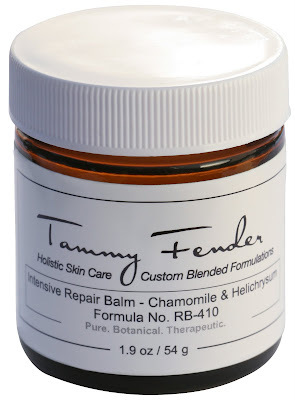 Here are some other great products in the Tammy Fender's line that I'm interested in.. Intensive Repair Balm contains Helichrysum, nature's healer, and claims to heal acne scars, fade under eye-circles, and so much more! Def. want to try this!